The deal builds on moves to expand regional ties and networks among countries in the Association of South East Asian Nations (ASEAN). This was also a central theme of an ASEAN eco-tourism forum Laos hosted for the first time in the town of Pakse in late June. The ASEAN Forum, with over 300 delegates, called for a coordinated roadmap for both public and private sectors to combine resources and expand economic opportunities along key corridors. Bosengkham Vongdara, Laos’ Minister of Information, Culture and Tourism, said the travel sector, especially eco-tourism, offered economic benefits to local communities. 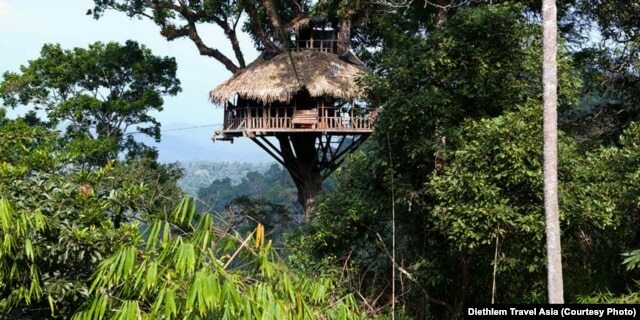 “Laos has placed greater emphasis on eco-tourism since 2009. As a result of eco-tourism development villages earn more income directly from tourists by selling food and homemade products as well as providing tourism related services,” he said. Tourism is major economic driver for the country. According to a 2015 World Travel and Tourism Council report, tourism’s total economic contribution in Laos was around 15 percent of total output (GDP), accounting for 13 percent of total employment. Buoyed by visitors from China, Japan and Korea, as well as travelers from Vietnam, arrivals rose 13 percent to 4.6 million in 2015. Pino Peruzzi, owner of the La Opera Italian restaurant which has been in business for 25 years in Vientiane, said tourism’s growth has been consistent in recent times. “It’s increasing every year. Every year you get more and more tourists. As the airlines start to fly to more countries so you get more nationalities to visit Laos. And things have improved a lot I would say over the years. More infrastructure is falling into place,” he said. New infrastructure has included a $61 million expansion of the Wattay international airport in Vientiane, due for completion in 2018. Calls are also being made for upgrades at domestic airports. Expanded air services are making their contribution to tourism. The low cost carrier Thai Air Asia said recently it was seeking clearance from Lao authorities to operate a second daily flight from Bangkok to both Vientiane and historic Luang Prabang. It launched the service in March. A treehouse that is part of the rainforest gibbon experience at Nam Kan National Park. But tailoring tourism products is still a challenge, says Raphael Kern, general manager of Diethlem Travel in Laos. Kern said visitors from China, Vietnam, Korea and Thailand provide new challenges for agents, while Europeans from France and United Kingdom favor the higher yield eco-tourism packages. “Different perspectives, different expectations – even different budgets. It depends on the culture, what they want to see, what they want to have. If you go with the Chinese markets, then you need Chinese speaking staff just to communicate and to fulfill their requirements. Some for the South Koreans as well. But the South Koreans are on average up to 90 per cent doing everything by themselves,” he said. Boosting eco-tourism’s profile in Laos, with its combination of trekking, cycling through national conservation areas and communities, kayaking and rafting, comes amid strong regional competition according to Klaus Schwettmann, an adviser for sustainable tourism with operator Green Discovery. “[Eco-tourism] it’s still a potential to develop but not sure. It depends very much on the Lao Government. Laos has not so many advantages compared to Thailand. They have everything in the same country, like beaches – you can combine say nature and beach holiday. [And] Myanmar has become a very big competitor – they have nature and culture,” he said. Schwettmann said while the potential for eco-tourism is there, he said the government needs to support the sector, especially by protecting national parks and the environment. The Lao government has taken steps to “crackdown” on unlicensed operators in tourist sites popular to young travelers, as well as sites connected to drug and alcohol abuse, including the town of Vang Vieng, where 27 tourists died in 2011, often by drowning and drug overdoses. Travel operators also say the government needs to ensure law enforcement protects the environment, where illegal logging and land clearing remain issues. Other concerns include the government’s backing of the construction of hydropower dams on many of Laos’ rivers. The dams impact tourism by threatening wildlife and the regional habitat – the very things that draws eco-tourism visitors.